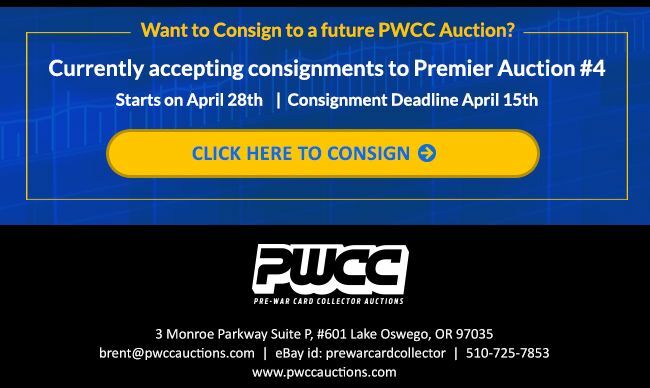 Another amazing auction is underway with PWCC Premier Auction #3. In addition to the top three huge items mentioned in the title, bidders will also find a 55 Topps Sandy Koufax PSA 8.5 and a 52 Topps Mantle with amazing eye appeal for only being graded 2.5 GD+. Multiple other Mays and Mantle rookies from the iconic 52 Topps set are available along with loads of other high quality vintage and modern items. For fans of post 1970 material, keep a close eye on the 1980 Topps Bird/Magic PSA 10, as it's price is sure to rival it's vintage rookie counterparts. Another rare and highly sought after late 70's Gem is the 1979 OPC Wayne Gretzky Rookie card which is offered in a PSA 9 Mint condition! These and thousands of other high quality items will be available. As always PWCC does not disappoint with often unexpected and unheard of new and record breaking auction closing prices of once over looked cards, now made famous because of this incredible bull market. What records will be broken this time? 850+ Astd 1981-1987 New York Yankees Baseball Cards! Fleer Topps Donruss Stars! 1981 Donruss #13 PGA Golf Tour RC Jack Nicklaus Rookie PSA 8 Near Mint! 1981 Donruss George Brett MVP #491 PSA 9 Mint Baseball Card.